With their party in laughable disarray, most members of Nick Griffin’s far-right BNP seem content to keep their heads down. But others have careers to build and division to sow. Thus, even in this period of hibernation, they seek a profile. One such is Carlos Cortiglia, who needs to put himself about, not least because he is standing as the party’s mayoral candidate for London. But platforms are hard to find. What to do? His solution has been nothing if not canny; he has been blogging on the Jewish Chronicle. It was easy, for until recently the paper had a system where any reader could set up their own blog and publish their thoughts. He penned at least three blog posts there, all moderate by the standards of JC bloggers, in fact “completely innocuous” as described by editor Stephen Pollard. Unacceptable nevertheless. 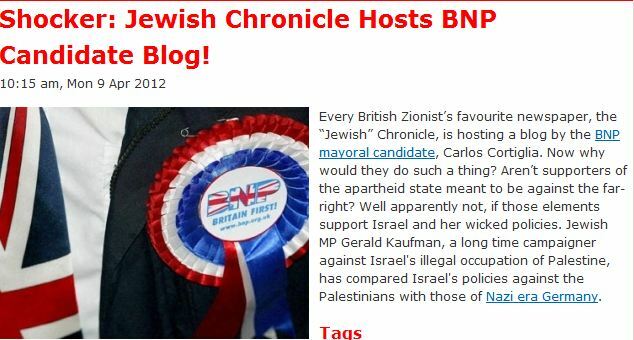 For although it boasts a Jewish councillor in Essex, the BNP never seems far from the whiff of antisemitism. Griffin, we know, received a conviction in 1998 for distributing material likely to incite racial hatred, and in the course of the prosecution made statements denying the Holocaust. Recently antisemitism appeared to fuel a row between activists on the south coast. “Hitler had a purpose with the Jews,” tweeted one local organiser approvingly. That’s the least offensive quote I could find. The BNP and the Chronicle were never a good fit. 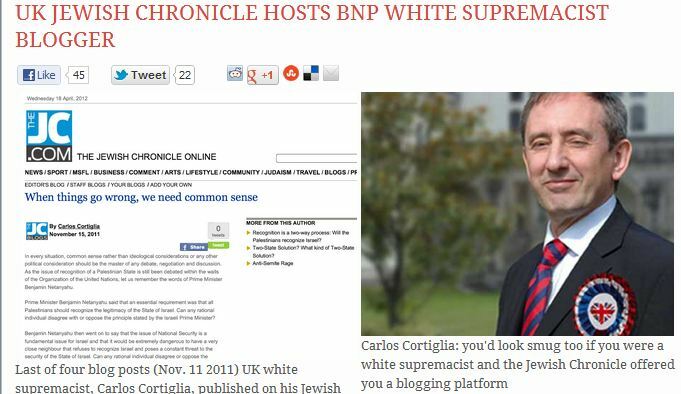 Of course, the suggestion that the Jewish Chronicle would knowingly associate with a BNP member is beyond ludicrous, and the innuendo that Pollard knowingly employed the services of an open BNP blogger is a smear, and grossly defamatory. Further, I spoke to Pollard on the phone on Friday, and here’s what else the Guardian blogger got wrong. Pollard, who was interviewed about the story by the Guardian’s ‘Belief’ editor, Andrew Brown, never claimed he became aware of Cortiglia’s blog and deleted all trace of it “last September”, only that he learned of it sometime in autumn. He made clear that the JC blocked the BNP member as soon as it was alerted to his presence on the site. Muir’s suggestion that Pollard misrepresented himself in the timeline of events is an outright falsehood. Even more insidious is the suggestion that Cortiglia’s BNP’s affiliation was known ahead of time by the Jewish Chronicle. As Pollard clearly and unambiguously informed the Guardian, they absolutely did not. As soon as they were alerted to the man’s BNP membership they immediately barred his access to the Jewish Chronicle site. They didn’t remove his post then. They blocked him from posting again, but his three existing posts did remain in the archive. They said Pollard lied about this because his posts were still searchable, but Pollard NEVER claimed he removed them. The BNP and the Jewish Chronicle are as far removed ideologically as possible and to suggest otherwise, by innuendo and rhetorical obfuscation, is the height of irresponsible journalism, and represents yet another smear by the Guardian of the UK Jewish community. By comparison to U.S. blogger Richard Silverstein’s coverage of the The JC, however, the Guardian’s journalistic indiscretions are less egregious. It’s not an exaggeration to say that Silverstein, taking the lead of Muslim Public Affairs Committee UK (MPACUK), outright lied about Pollard and the Chronicle. While anyone even remotely familiar with Silverstein shouldn’t be surprised by anything published at the blog of the former Comment is Free contributor, the following truly should win an award for outright dishonesty. Notice, Silverstein is still shamelessly writing (in the caption under the photo of Cortiglia) that The JC “offered” the white supremacist a blogging platform, which is a complete and total lie. Plus, notice the similarity between Silverstein’s headline and that of MPACUK. Briefly, MPACUK‘s extremism and antisemitism is well documented. They have promoted the idea of a worldwide Zionist conspiracy and used material taken from neo-Nazi, white nationalist, and Holocaust denial websites. A report by the All-Party Parliamentary Group Against Anti-Semitism also notes the CST’s assertion that “[t]he use of ‘Zionist’ as a replacement for ‘Jewish’ is common on the MPACUK website” and that MPACUK has articulated antisemitic conspiracy theories through the language of anti-Zionism. [All of this] leaves one wondering who to believe: an Islamophobic pro-Israel ultranationalist or a reporter for one of England’s most distinguished newspapers. Silverstein calling Pollard “Islamophobic” and “ultra-nationalist” just means, of course, that he, and his paper, supports Israel’s right to exist, and isn’t afraid to condemn Islamist antisemitism when they see it. As far as Silverstein’s characterization of the Guardian as “one of England’s most distinguished newspapers”? Well, if by “distinguished” he means, unique in conflating reactionary, violent, antisemitic Islamism with progressive thought, he’s correct. In this category, the UK broadsheet is truly in a class by itself. As recently as April 19, Yom HaShoah, they provided a platform to radical Islamist preacher Raed Salah, promoter of medieval blood libels, who proceeded to accuse the UK Jewish community of being “supremacists”. Inayat Bunglawala, an Islamist who believes that the the BBC and the rest of the media are “Zionist controlled” was a contributor to ‘Comment is Free’. Again, bear in mind, these hateful extremists were not blogging in an open blogging platform, but were approved and published by Guardian editors. Here are excerpts from an email Pollard sent to Silverstein in response to his baldface lies. I suggest that you preface any posts about me and the JC with the words: “This post is made up and has no basis in fact”. Silverstein is one of the more shrill, dishonest, and hateful extreme left commentators in a very crowded anti-Zionist blogosphere, and, as the title of his blog, Tikkun Olam, (To heal the world), continues to make a mockery of such self-styled progressives bloggers. Several months ago, for instance, he thought nothing of exposing the identity of a Zionist blogger, including his address, potentially placing his entire family at risk. Also, for those unfamiliar with his brand of “liberalism”, and self-styled promoter of “social justice”, it includes expressions of support for a one-state solution, repeated defenses of terror groups like Hamas, and characterizations of IDF soldiers as “bestial” and “subhuman. And, he has even likened Israel to Nazi Germany. Finally, the very notion that the UK Jewish community could even conceivably find common cause with the BNP would be dismissed out of hand by all but the supremely dishonest or those ideologically conditioned to find such implausible alliances politically convenient enough to advance. The behavior of both Silverstein and the Guardian in this episode (demonizing a mainstream UK Jewish publication, while finding ways to legitimize the most reactionary political forces in the world today, under the absurd veneer of “progressive” thought) demonstrate what this blog has argued continually. Much of the the modern Left is in a deep ideological crisis, one which they don’t seem prepared to acknowledge, yet alone overcome. Silverstein and the Guardian deserve each other. Both are despicable. I call on all right-minded readers and advertisers to boycott the Guardian. I have heard that Silverstein has been identified as a malignant narcissist and that such “people” are very bad news. With a lot of luck he’ll bite the Guardian and it’ll expire from a variant of rabies. I think Silverstein is actually deranged. He lives in a world of vituperation towards anyone who opposes his insane blog, and demanding adoration from those who do not. Snigger is right, AKUS. Silverstein exhibits all the symptomology of malignant narcissism, particularly the need to be adored and the vengefulness against those who don’t adore him or who try to expose him as well as the complete lack of insight into his own behaviour. He is beyond help and he and the Guardian are fitting bedfellows. Does anyone expect anything accurate from Silverstein? He considers Press TV a reliable source in regards to the Mossad, and immediately distrusts anything said in an Israeli paper. I honestly have a feeling he’d claim the sky was green if the JPost said it was blue. Before changing its policy of open access blogging the JC allowed Jew-haters to publish like the well known Rushkin/Moeran of CIF, and posters like Mary in Brighton, Real Zionist etc. While SIlverstein and this laughable MPACUK bunch are obviously full of bull, what exactly did the G.’s Hugh Muir say here that was so offensive? Where did he suggest “that the Jewish Chronicle would knowingly associate with a BNP member”? Or that “Pollard knowingly employed the services of an open BNP blogger”? Where is the “grossly defamatory smear”? Where exactly did Muir “smear the UK Jewish community” or “demonize” a mainstream UK Jewish publication? Erm … can CiFWatch (or anyone else) perhaps answer my queries? There are five. Forget it they don’t do question answering. ” Once the JC realized that their system had been abused by the BNP, they changed the entire system and removed the open access.” Not true.